the liberty and the means of following his own taste. 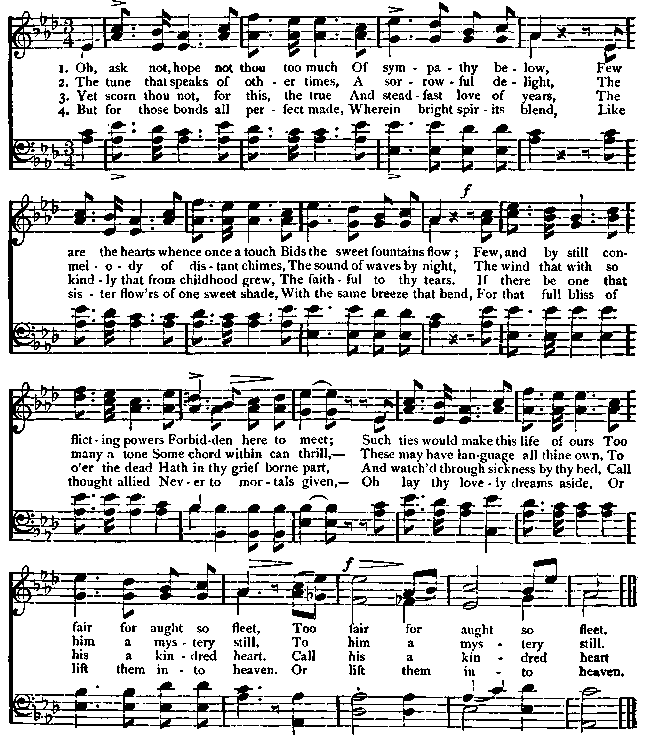 Hymn-books have often been so fastidiously made, as not only to exclude many hymns, as extravagant, that were not half so extravagant as are the Psalms of David, and as is all true and deep feeling which gives itself full expression; but also those retained have been abused by corrections, so called, and tamed down from their noble fervor and careless freedom, into flat and profitless propriety. No lan�guage can well replace that which the original in�spiration of the author suggested.�H. W. Beeclier, One evening, I found Felix Mendelssohn deep in the Bible, " Listen," he said, and then he read to me, in a gentle and agitated voice, the passage from the First Book of Kings, beginning with the words,. " And behold the Lord passed by." " Would not that be splendid for an oratorio ?" he exclaimed ; and it did become part of his work, the Elijah.�Hiller.